"The Edison Restaurant" Celebrating his first restaurant with family. Grand Opening October 2016. Chef John Mikhail Minas credits his Armenian mother, and Assyrian grandfather as the influence behind his passion for staying in the kitchen. This devotion shaped him as a natural for his profession in the culinary arts. John Minas grew up in Boston, Massachusetts. Every Sunday, John watched his mother, and grandfather lovingly prepare traditional Armenian, and Middle Eastern dishes for their large family, recipes passed down for generations from both sides. As a first generation American, food connects Minas to his cultural heritage. In 2006, Minas trained at the Culinary Institute of America, and worked in various high-end restaurants throughout New England. From there to here, following a path of commendable cuisine experience, Chef Minas offers “real” food, prepared simply to those who crave healthy meals, full of flavor. Selected as the Executive Chef to Florida’s Governor in 2011, Chef Minas served Governor Rick Scott, and First Lady Ann Scott, more than four years. During his term as chef to the First Family, he authored the award winning Viva la Florida "Simple, Fresh & Elegant Recipes from the Florida Governor's Mansion". This cookbook commemorates Florida’s 500-year anniversary. Staying true to his dedication, Minas proudly prepared wholesome, full-flavored dishes featuring Florida’s bountiful seafood, and agriculture. Chef Minas also represented The State of Florida in the 2011 Great American Seafood Cook-off, competing against top chefs from around the nation. 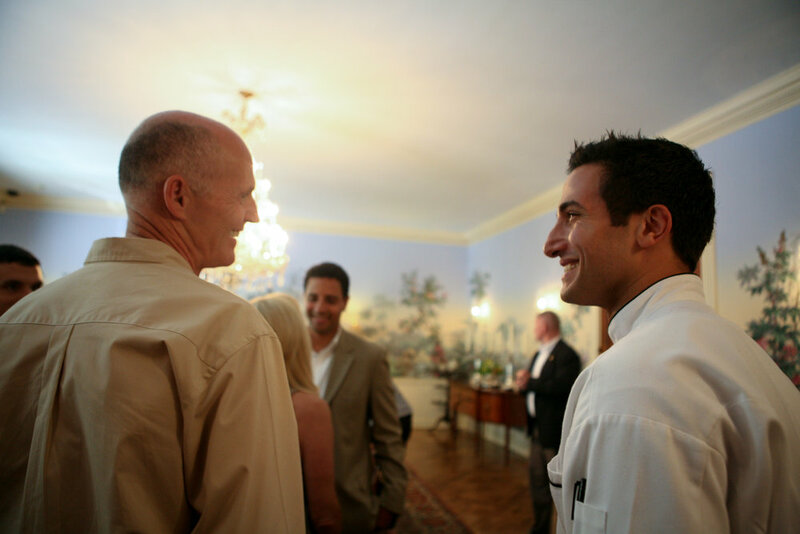 Governor Rick Scott and Chef Minas sharing a moment in the State Dining Room after the Great American Seafood Cook-off tasting. After successfully serving the Governor and First Lady of the State of Florida, Chef Minas accepted the challenge to design, and launch an elevated dining experience in Tallahassee’s most unique, and newly renovated historic Electric Company building, in Cascade Park. Assuming the role of Managing Director and Executive Chef, Minas crafted a simple, fresh, and elegant menu. Faithful to his expertise, he blended cuisine from his heritage with north Florida local flavor. The Tallahassee community enthusiastically welcomed the young chef, and rewarded the one-of-a-kind restaurant experience with the recognition of “Best New Restaurant" in Tallahassee. The opening of The Edison Restaurant drew substantial attention locally and beyond, generating a flurry of events, interviews, and television appearances. Such successes led to Chef Minas’ selection as one of the top-notch chefs to participate in the 2017 Naples Winter Wine Festival alongside such celebrity chefs as Tom Colicchio, Enrique Olivera, and Master of Ceremonies Wolfgang Puck. Subsequent to his success at The Edison Restaurant Chef Minas combines his entrepreneur skill with the humanitarian efforts of celebrity chef, Art Smith. Chef Art’s 501c3 Reunion Center, a community culinary school highlighting deep community engagement, is in his historic Wardlaw-Smith House located in Madison, Florida. In this rural city, about 45 minutes outside of Tallahassee, Chef Minas cultivates philanthropic skills via community outreach, and sustainable food systems with a focus on food education, and culinary workshops. Enriching his appreciation of philanthropic work comes by way of shadowing Chef Art Smith. Alongside Chef Art, Minas participates in celebrity dinners, international culinary diplomatic events, and various philanthropic food events in the United States. Chef Minas, at the Governor's Mansion, educating local students and community members demonstrating a simple healthy snack substitute.